Upon the release of our next expansion, Victory is Life, all characters will find themselves capable of earning levels beyond the current cap of 60. Starting immediately, any and all Experience earned will start players on the path toward the new maximum level cap of 65. It has been almost four years since the last time we raised the Level Cap in Star Trek Online, which coincided with our second expansion, Delta Rising, in October of 2014. Since then, the game has expanded and grown by leaps and bounds, adding hundreds of hours of gameplay and a huge number of new story-driven missions, queues, battlezones, starships, costumes, and much, much more. The game is continuing to grow, continuing to expand, and continuing the story of the franchise that we all know and love. And this time, that is what the Level Cap Increase is primarily meant to reflect. In addition to raising your level, Victory is Life will also raise the cap on Item Marks! Players will now be able to progress their equipment to Mk XV (15) by using Upgrade Tech, and investing in them via the Item Upgrade System. The Technology Points requirements increase at a linear rate beyond 14, and any points already present on an existing item will not be lost and can immediately be utilized to facilitate that item’s progression to 15. Equipment of Mk XV will require at least Level 60 to be worn. Players already at the current level cap may begin enhancing their gear immediately when the expansion goes live. Fear not! We’ve got you covered! As you can see, the amount of Experience required per Specialization Point is actually remaining exactly the same, despite us having given you five more levels to attain! Any existing Specialization XP you have earned above level 60 – progression you currently have earned toward a Specialization Point – will be immediately converted to a free specialization point for your account. This means that anyone who's earned any XP beyond 60 will earn a specialization point right at the start. Progression through the existing levels in Star Trek Online is primarily accomplished by completing story missions, as laid out in your Captain’s Journal. It has become an expectation of our progression that completing one of these story missions will generally reward you with at least half of a level (generally more), making them almost always the most efficient means of earning Experience and leveling up. We don’t intend to upset this expectation with Victory is Life. Each of the new Story Missions being released with this Expansion will grant all Captains more than half a level each (and even more if you’re using an XP Bonus Pool! ), meaning that you will be well on your way to the new cap without needing to invest much outside of the central plot as it unfurls before you in the Gamma Quadrant. Each Profession (Eng, Sci, Tac) will gain access to Rank I of an all-new Ability for use during Space Combat! * More details coming soon! Multiple high-quality Duty Officers, direct from the Gamma Quadrant. Fill your roster with members of the alien species seen on-screen in episodes of ST:DS9. The ship of Elim Garak himself can be called to aid you on Admiralty Assignments. Let's just say you'll have earned a favor or two by the time you've reached this level. 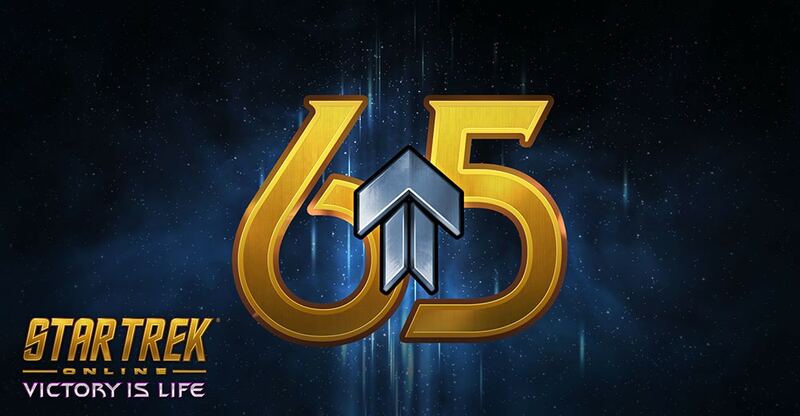 In addition to the above rewards, earning each level beyond 60 will also grant one Captain Specialization Point. In light of all the things that a level cap increase can be to an online game, we feel it’s important to list out a few things that will not be included with Victory is Life, so that proper expectations can be set. Captains (or Admirals, or Generals, etc.) have progressed quite far in their careers already. We didn’t feel as though an increase of five levels was sufficient to warrant the inclusion of any further Ranks to signify this career improvement. This has been a common question asked in our communities ever since the Level Cap Increase was first announced. As of now, we have no intention of extending the ship ranks available in Star Trek Online beyond the current Tier 6 offerings. Additional ships will always be a fact of life as this game continues growing and expanding, but we’re not currently planning any upward expansion in this regard. As with all Content that has been released for Star Trek Online, there will be no purchase necessary to advance beyond level 60. In fact, all of the story missions contained within the Victory is Life expansion will be free to all players! Levels themselves are only a part of the picture in Star Trek Online, with other important aspects of your character’s overall progress represented by systems like Specializations, Reputations, Item Upgrades, Starship Mastery, and more. As these have continued to grow over the past several years, levels themselves have come to mean less and less. This Level Cap increase is not an attempt to change that perception, or to upset expectations as to what a level means in this game. Instead, we’re hoping to use this as an opportunity to show other potential players, as well as Star Trek fans everywhere, that this game – this rich, robust, story-driven experience – is still growing, still changing, still expanding, and still waiting for them to enjoy.